2013 was a year filled with talk of drones. I’m not saying this just because I’m biased by the recent news reporting on how large companies (Amazon, DHL, and UPS to be exact) are exploring the use of drones as a new delivery mechanism. If this is news to you, don’t worry. The robotics community came across this only a couple of weeks ago. Earlier this month, Amazon announced that it has been developing a drone-based delivery service called Amazon Prime Air that is meant to delivery items to your door in about half an hour. Then came a series of reports by other companies claiming that they are looking into similar ideas themselves. But these drones are not going to be flying above your backyard any time soon because the world needs to figure out how to regulate drone technologies first. Many people still associate the word ‘drone’ with controversial military technologies despite the use of drones for journalism, mapping and search and rescue missions. 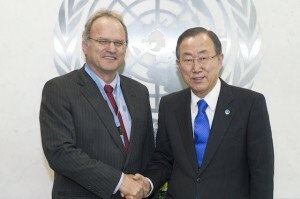 Secretary-General Ban Ki-moon (right) meets with Christof Heyns, UN Special Rapporteur on extrajudicial, summary and arbitrary executions, 29 October 2013,United Nations, New York. Photo credit: UN/Eskinder Debebe. That reminds me of another drone-related news story from this year: in April, a coalition of non-governmental organizations (NGOs) called the Campaign to Stop Killer Robots was launched. With a thorough discussion on the current use of drones (remote controlled), the organization argued in front of the UN that an extended, more autonomous version of the current robotic military technologies could be dangerous at a global scale. 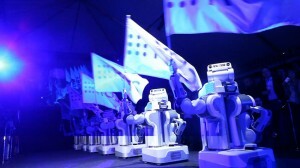 By November of this year, this group had already grown into the organization that got the UN Secretary-General, Ban Ki-moon, talking about killer robots to the nations. Of course drones didn’t invade the robotics news world all year long. Some of us may have forgotten this already, but Willow Garage, the company that enabled so many roboticists to adopt the open source mindset and stop reinventing the wheel with ROS and PR2, shook the robotics community earlier this year by shutting down (most of its employees joined Suitable technologies according to the last blog post from Willow Garage). If I were to think about Willow Garage and the rise of delivery drones in a one-dimensional manner, it would seem that the state of robotics industry is in rocky waters, where there’s a lot of interest in making money using non-traditional robotics (i.e., not the stereotypical industrial robots), but it is still hard to tell how many of these new business ventures will be successful. But thinking of it in another dimension, I think 2013 was the year that demonstrated the complicated nature of robotics, not in terms of just the technical stuff that goes in it, but in terms of its relationship with societal, ethical, and legal issues — whether it be discussing the efficacy of open source robotics or societal acceptance of drones in civilian territories. This post was first published on Robohub.org. Read up on what other experts say about 2013 here. Next What does it mean to have giants like Google, Apple and Amazon investing in robotics?